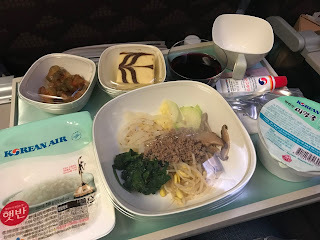 In May, I took Korean Air from New York to Incheon. It was a direct flight from JFK to ICN. 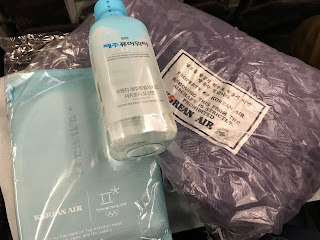 So, I'm finally getting around to writing some travel posts about my trip to Korea in May. Better late than never, right? My boyfriend and I had booked our tickets next to each other, but we had a bit of a hiccup. 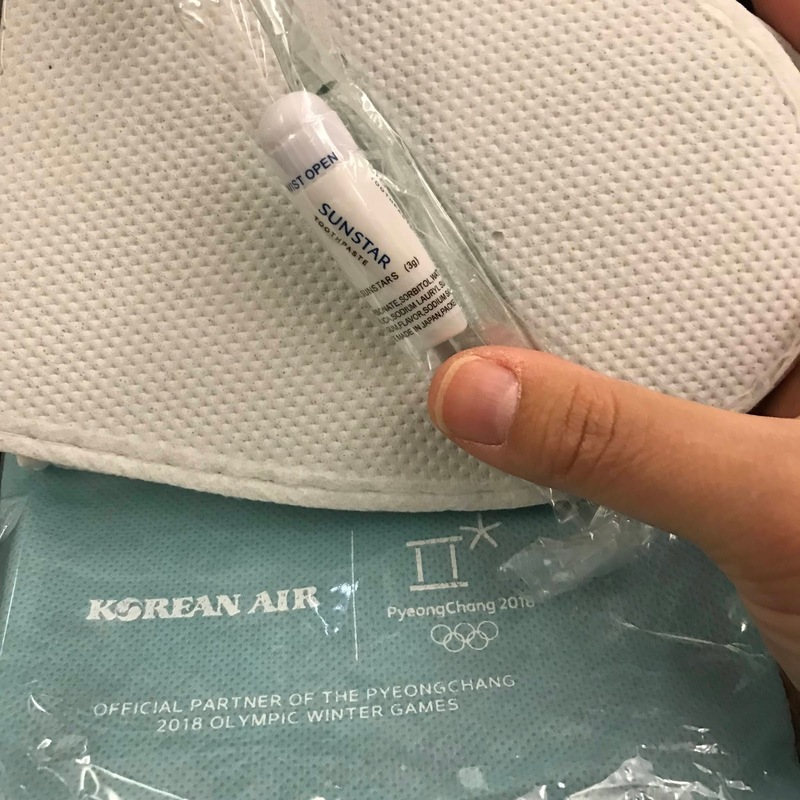 He had used his Chase awards to book the seat and didn't see in the fine print that he had to go into the Korean Air website to confirm the seat. 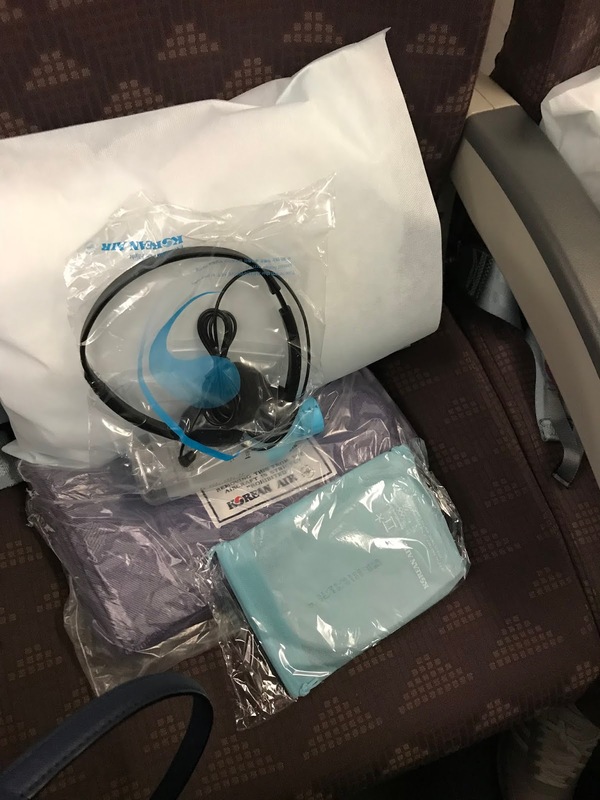 As a result, they had moved his seat on the fully booked plane to a different row. The agents were super nice and they said they were going to try to do everything they could to get us to sit together. They worked their magic! We ended up getting better seats even. It was the last row in the middle section. I think some people may not like it, but it worked well for us. There's slightly more leg room and you can fully recline your seat without worrying about the person behind you. Korean Air gives you a bottle of Jeju spring water, a blanket, headphones, and a toiletry pack (the light blue pack). 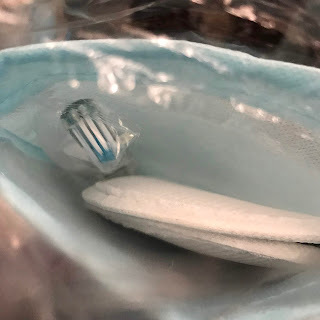 Inside the toiletry package, there's a toothbrush with a mini toothpaste, so you don't have to worry if you forgot yours. They also give you some disposable slippers. While I was consulting in Korea, one of my clients told me about these stickers. 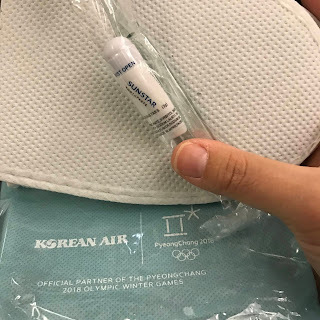 I had flown Korean Air many times before and never really noticed it before. 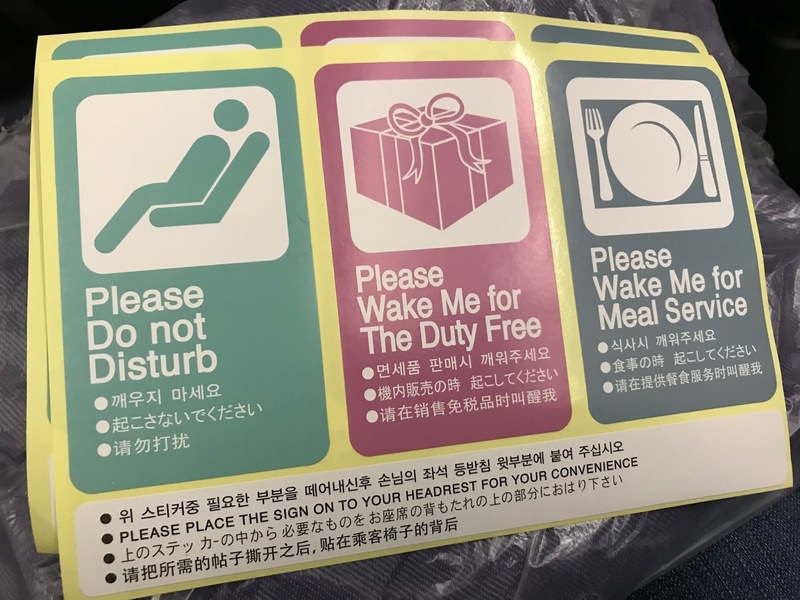 These stickers are quite useful if you're planning on sleeping during the flight. I decided to get all of the "Korean" options to share with you. Also, some of the other options did not seem like something I wanted to risk on the plane. This is the famous Korean Air bibimbap. The gochujang is n the teeny tube. You can add as much or as little as you would like. 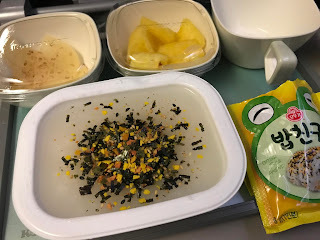 The rice comes in the haetban container, the rectangular container and there is also some seaweed soup to the right. The side dish for me was the spicy cucumbers. There was also a cheesecake...the bottom was more of a spongecake. It wasn't my cup of tea. As you're eating the flight attendants will come around and ask if you want tea or coffee. They also do a wine service. The other options were some sort of tomato pasta and then chicken. They only talked to me in Korean and that was all the info they gave me. I think the English descriptions were far more descriptive. The chicken looked kind of like it was in a cream sauce. This was the second meal breakfast. Again, they gave me only the descriptions in Korean. I was super hungry, but neither sounded good, to be completely honest. They legit just said...we have jook (Korean rice porridge) and ppang (bread). I was like...I don't want just bread for breakfast. In all honesty, the ppang option seemed to be a croissant sandwich, just for your reference. This is the jook option. 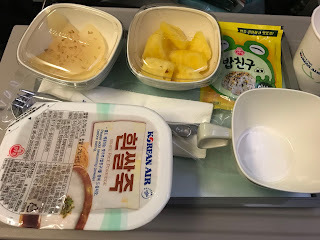 The side dishes were the Korean pickled daikon and then for dessert was pineapple. In the yellow package are the flakes you put on your porridge to give it flavor. This is after I "prepared" it. The bapchingu is actually a pretty good thing to buy in Korea. It can elevate your rice. You can also use it to make rice balls or the like. 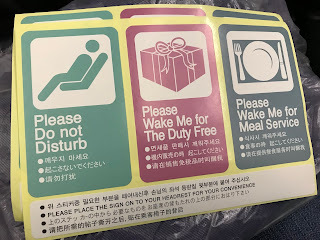 I SLEPT THROUGH SNACK SERVICE. I'm so sad. We both woke up and were like "Where did these people get chips???" Honestly, I was kind of hungry when I got to Incheon, but it may be because it was almost dinnertime NYC time. I slept pretty much the entire flight...like almost 12.5 hours, so I was ready to go for the day when we arrived at Incheon at about 4AM. The package below is SUPER cute, but inside you'll find 20 packs of small individually wrapped packs. It's perfect for bringing with you to work.